The Foyer welcomes in your guests and sets a tone for the rest of your home. This area should not be overlooked when designing a lighting plan. If the foyer is a smaller area, a chandelier or a few wall sconces can provide enough light to make the transition from the outdoors into the home. If it is a larger area, incorporate recessed or track fixtures for instant drama. To add more lighting, you can display lamps on side tables or a buffet, columns can be flanked by torchieres, art on the walls can be lit and plants can be highlighted with portable up lights. If there is a closet in your foyer, add a fixture to the closet to be sure there is enough light to see into it. 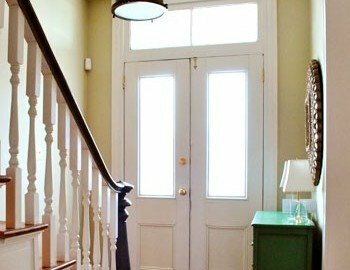 How high do I hang the chandelier in my foyer? The bottom of the chandelier should be at least 8 feet above the floor. If the ceiling is very high, the chandelier may be hung higher than 8 feet. If there is a window above the front door through which the chandelier will be seen from the outside, the chandelier should be hung centered in relation to the window. What size chandelier do I hang in the foyer? The size of a chandelier should be chosen based on the width of the foyer, the ceiling height and any architectural details, such as double doors, or a window above the front door. A general rule is the chandelier width should be at least the same size in inches as the diagonal measurement of the room in feet. Example: If the room is 20 feet on the diagonal, then your chandelier should be about 20 inches long.